robots inspiration to implementation by Joseph L Jones and Anita M. Flynn. His function is to serve as a learning platform for my self, and an excellent platform it as been. circuit board is the Rug Warrior single board robot. modified servos made to rotate 360 degrees. 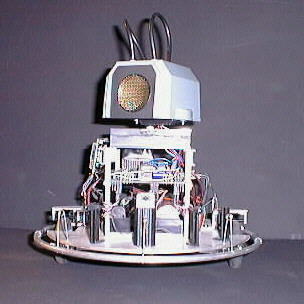 The robot is programmed in Interactive C.
· A pair of Photo cells also mounted in front. · A Microphone for sound detection. · Shaft encoders for velocity monitoring. form a dead mouse and mounted then on brackets that hang over the wheels. Email me at: nicolson@oeonline.com .